In recent years, there has been a tremendous increase in the understanding of stem cell biology. The potential clinical applications lead to an extended interest in the use of stem cells in many medical disciplines. Adult stem cells seem to be almost comparable to embryonic stem cells with respect to their ability to differentiate into various tissues, a function that has been termed “stem cell plasticity”. I strongly believe that using patient’s own stem cell derived from their body fat could aid not only in plastic surgery procedures such breast reconstruction, facial deformities caused by an injury or congenital defects and burns, but also in the cosmetic surgery field in procedures like face lift and facial rejuvenation, breast augmentation, body and buttock augmentation and reshaping and hand rejuvenation. The purpose of this website is to present current information about the role of adipose-derived stem cell in plastic surgery and cosmetic surgery. As plastic surgeons, I feel we are uniquely qualified to embrace this promising new technology considering how frequently we perform liposuction and fat grafting. Discuss all the controversy and confusion surrounding the misuse of the term stem cell in plastic surgery and face lift. I have been interested in stem cell therapy in plastic surgery and regenerative medicine for several years, I have written a book chapter on facelift using adipose-derived stem cell in “Stem cells in aesthetic surgery” by Springer, I have performed face lifts and facial rejuvenation techniques based on the use of stem cell internationally and lectured on the subject all around the world. I firmly believe that the introduction of stem cells in plastic surgery is the beginning of a new era: we will be finally able to rejuvenate patients not only at the tissue level but even more importantly at the cellular level. As promising as this field appears to be, it is important to emphasize that all the information presented here needs to be further evaluated, more studies need to be performed to really understand this complex subject and conclusions can’t be drawn yet about the safety and the efficacy of any of these treatments. 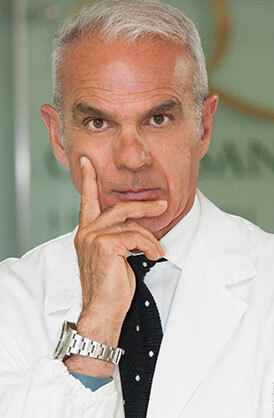 Dr Renato Calabria, MD, FACS. Dr. Calabria has been using fat grafting (also called fat transfer), which contains adult stem cells, on the face with the distinct purpose to rejuvenate the skin and add volume. The non-surgical Stem Cell Facelift isolates stem cells from fat through a complicated enzymatic treatment and concentrating them almost ten times more than the fat. This turbo charged graft is then re-injected in the face. . Breast contains fat in large amount so fat grafting is an ideal filler for breast enlargement. Fat is removed from an area which has it in excess and is used as an alternative to breast implants. 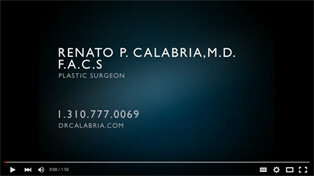 "I can say with great certainty that Dr. Calabria is one of Southern California's finest & talented leading plastic surgeons. He has been my Dr. for five years." “There aren’t enough word to express the gratitude and affection I feel for you. Not only are you a gifted surgeon but you are a genuinely kind and good man. I had face and neck lift inconjenction with a stem cell facial rejuvenation. It helped so much with my skin color, and texture, and firmness in conjunction with tightening of the excess skin. Dr. Calabria did an amazing job, it looks so natural. I'm so happy with the results.